Cyclists from across North Down are buoyed up after participating in the Yard Men Cycle Ride on Sunday 1 April 2012 when hundreds of cyclists used pedal power to converge at the new Titanic Belfast Visitor Attraction. 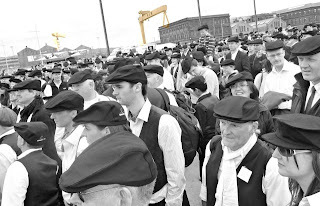 The spirit of Titanic was rekindled when cyclists travelled to the shipyard using the same mode of transport used in 1912, wearing flat caps and enjoying a well-earned piece upon arrival. Organised by Sustrans for the Bicycle friendly Borough campaign and supported by both Friends of the Earth and Bikeworks Cycle Shop bicycles left Holywood just after noon and utilised the North Down Coastal Path to meet up with many others who had earlier walked from Pitt Park or cycled along the Comber Greenway from the Billy Neill Centre. Mayor of North Down Cllr James McKerrow came along to support the ride and waved off the cyclists as they departed on their voyage to Belfast which helped raise money for and awareness of Bowel Cancer UK.